Dr. Duncan Copp, a dentist in Sydney, Australia, contacted us to assist him in completing a customized website design for his practice. Dr. Copp worked very closely with Rosemont Media’s team of writers, designers, and developers in order to carefully craft a dental website design that met his practice’s needs. The user-friendly layout of the website allows for viewers to quickly and easily find the information they are looking for. Potential and current patients can read about procedures offered at the practice and better understand their options. Some of the general, restorative, and cosmetic dentistry treatments featured on the site include teeth whitening, dental implants, Invisalign®, and porcelain veneers. Patients can also learn more about how The Paddington Dental Surgery does its part to remain a green dentistry practice. With its responsive design, Dr. Copp’s new website is equipped to provide patients with a user-friendly experience no matter which Internet-capable device they use to access it. Additionally, the site is optimized with dental SEO strategies intended to help Dr. Copp remain visible in web searches and maintain a competitive edge in his online marketplace. 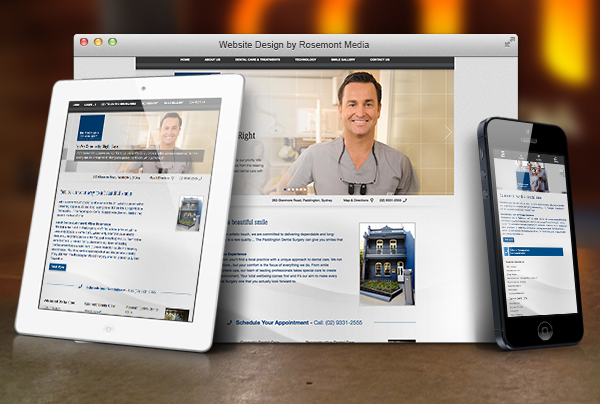 To see an example of a customized website created and managed by Rosemont Media, please visit www.thepaddingtondentalsurgery.com.au.